Let’s all sing along, shall we? After we declared our independence, we did not have the protection of the British; and we had no effective navy of our own. Sea lanes in the Mediterranean were controlled by pirates along the Barbary Coast — Morocco, Algeria, Tunisia, and Libya. In the Treaty of Tripoli (1796), the United States arranged to pay a yearly tribute for safe passage through the Mediterranean. The pasha of Tripoli raised the amount of the tribute in 1801. President Thomas Jefferson refused to pay. The pasha declared war on the U.S. 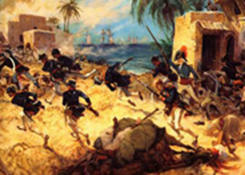 In 1805, the U.S. Marines stormed the pirate stronghold, and one result was a new verse in the Marine Hymn. The United States was not founded on the Christian religion? In the spring of 2004, the Constitution Restoration Act was introduced into both Houses of Congress. The House version is designated HR 3799, the Senate version is SR 2082. Drafted by Herbert Titus, the first dean of Pat Robertson’s School of Public Policy, the Act asserts that god is the sovereign source of law. Then it takes one more step. Notwithstanding any other provision of this chapter, the Supreme Court shall not have jurisdiction to review, by appeal, writ of certiorari, or otherwise, any matter to the extent that relief is sought against an element of Federal, State, or local government, or against an officer of Federal, State, or local government (whether or not acting in official personal capacity), by reason of that element’s or officer’s acknowledgment of God as the sovereign source of law, liberty, or government. To the extent that a justice of the Supreme Court of the United States or any judge of any Federal court engages in any activity that exceeds the jurisdiction of the court of that justice or judge, as the case may be, by reason of section 1260 or 1370 of title 28, United States Code, as added by this Act, engaging in that activity shall be deemed to constitute the commission of — (1) an offense for which the judge may be removed upon impeachment and conviction; and (2) a breach of the standard of good behavior required by article III, section 1 of the Constitution. The Act does not, in and of itself, spell the end of the separation of church and state; but it is another step in that direction. An earlier version of the Act called for the display of the ten commandments at federal facilities and sought to undermine the separation of powers by exempting such displays from review by federal courts. A third bill, HR 3313, has a similar purpose. If enacted, HR 3313, the Marriage Protection Act, would outlaw federal court review of a fourth bill, the Defense of Marriage Act, which is an attempt to define marriage in putatively “Christian” terms. A revised version of the Senate’s 2004 Restoration bill was referred to the Judiciary Committee a few months ago. Conservativepetitions.com is looking for support of the Restoration Act; Alan Keyes has written about the left-wing attack on people of faith. The recent brouhaha over a few judicial nominees wasn’t about the Senate filibuster rule; it was about the claim that Democrats want to keep believers off the bench. Democrats and leftist judges wanted Terri Schiavo to die, remember? Google “constitution restoration act” and you will find many sites arguing that HR 3799 is the most important legislation in fifty years. It will protect us from unelected judges who wantonly abuse their power in pursuit of a secular, atheist state. What is the opposite of a secular state, if not a sacred state? Every new & successful example of a perfect separation between ecclesiastical and civil matters is of importance. The civil government ... functions with complete success ... by the total separation of the Church from the State. The current administration claims they are not bound by domestic law or international treaties. They claim the authority to hold people without charges, without access to the courts or to an attorney, for life. They have used “extraordinary rendition” to hand prisoners over to torturers in “friendly” regimes. The neo-cons have launched attacks on the Fourth Amendment to the Constitution, the Fifth Amendment, the Sixth, the Eighth. With god on their side, why stop there?